We arrived in Channel Islands Harbor late last September. We had a reservation and slip assignment for the Channel Islands Harbor Marina. We arrived mid-day, in beautiful weather. Excited to be in a new harbor and a new marina, it took a little extra cruising to spot our new place among all the other marinas. Spot it we did, and into the slipway we went. We were amazed at the sight – there were “chicka-chicka” (oscillating) sprinklers running full blast on most of the slip fingers! Huh? This was new to us! Our slip was in the middle of all the spraying/sprinkling. I refused to attempt to dodge a sprinkler to tie up the boat. Well, I refused because there were dry docks available – so why should I get wet? But – why – we asked – are sprinklers watering the docks? Is this a new dock cleaning method? Do you hope they will grow? What? Nope, not at all. The ocean water temperature changed, and with the change bait fish moved into the harbor. Along with the bait fish, came the sea lions! And the sea lions were attempting to move into the marina – no reservation, no moorage payments – only sticky, stinky, messy destruction! The sprinklers discouraged them from setting up on some of the docks. And, it wasn’t just this marina or this harbor. (Check on the link at the bottom of the blog.) All along the southern California coast sea lions were moving into harbors and marinas. And they don’t come one at a time. No, they come in groups. Large groups are called colonies, and small groups in the water are called a raft. It is fun to see them out on the water. Often, all you see at first is a handful of fins. The closer we get the fins “sink”, and then the sea lions heads pop up to check us out. They look kind of cute, and in no way do you get a sense of their size. The irony, a raft of sea lions wanting to live on a dock. And I do mean “a” dock. Though there is a lot of grousing, noisy, fending off of other sea lions, they all want to be together. Here is a bunch of them on one dock. In general they usually took at least two docks to all fit, but there were often several sets of docks being over taken. These guys are no light weights! Anything but. Soon the docks are overburdened and sink, ultimately destroying the dock. We have seen as many as 10-12 on a single finger. Then sea lions start rolling off and fighting to get back on. They finally moved on late in the year, then about a week ago, they came back. Watch and listen to them grouse at each other. Did you love the sounds of their fussing and grousing? Okay, fine. NOW think about that same noise off and on all hours of the day. Try 0300 and going on for a few hours. Seems they go out feeding in the night, come in all excited and chatty about the hunt. At some point they get quiet for awhile, and then later in the day they start all over again with their routine. We are at the opposite end of the docks these guys are on, but the noise still wakes us. I feel for the folks that are aboard down on their end of the marina. And if noise and dock destruction were insult enough – they smell horrible, leave a oily substance on the dock that is impossible to wash, and even worse they leave “deposits”. And now the boaters down there are fighting flies drawn to the smelly sea lions. The sea lions bring out the local and visiting folk. 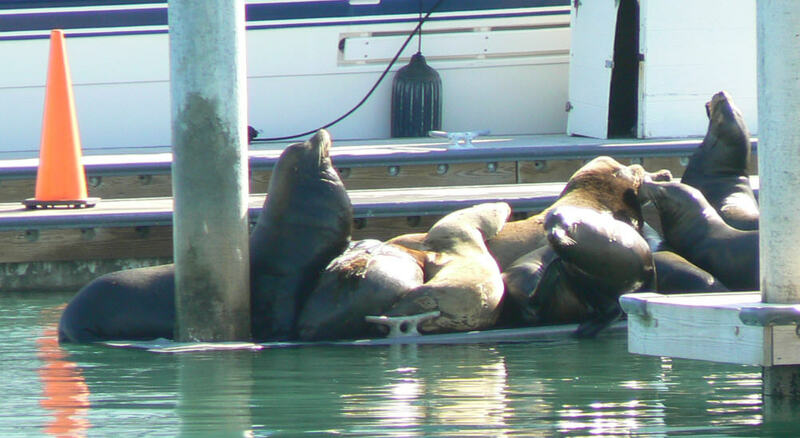 The sea lions made our marina – and others – tourist attractions. Charter boats, local boaters with their friends and families, kayaks – all sail over to see the sea lions. Folks come from all directions to see the sea lions. Hey, what can I say. All in a day- At home – with Noise in the Marina.